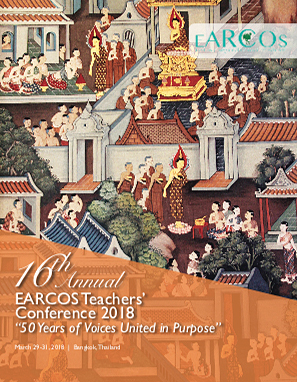 We are pleased to announce the 16th annual EARCOS Teachers' Conference (ETC2018) in Shangri-La Hotel, Bangkok, Thailand scheduled for March 29-31, 2018. We have a host of excellent keynote speakers and workshop presenters. Our keynoters are: Dr. Chip Donohue, Norman Kunc with Emma Van der Klift, and Pernille Ripp. We think the conference will prove to be professionally stimulating and will provide you with an opportunity for networking and building camaraderie. Theme: "50 Years of Voices United in Purpose." 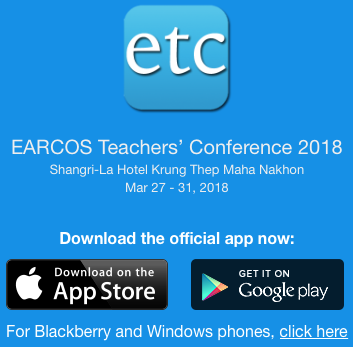 Registration will be accomplished exclusively through EARCOS online portal. 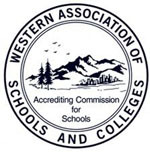 Each school will receive a designated username and password to access the registration form. All required information is self-explanatory. 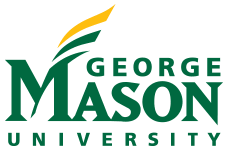 The username and password is given only to the Teacher Representative (TR). EARCOS will work through this one designated individual. Beware of offers from Expo Housing Services and similar companies. 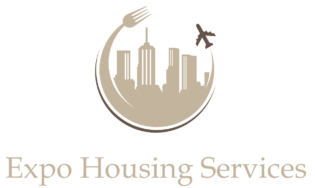 It has come to our attention that Expo Housing Services has been targeting EARCOS attendees, claiming to be a part of EARCOS and offering housing and hotel reservation in Shangri-La hotel. PLEASE USE THE RESERVATION LINK IN THE COVER LETTER THAT WE HAVE SENT TO THE TEACHER REPS. TO GET THE SPECIAL RATE FOR THIS CONFERENCE. Please be aware of this scam and others. If you have heard of other scams, please contact the EARCOS office right away or email us at etc2018@earcos.org or gsison@earcos.org attention to Ms. Elaine Repatacodo or Giselle Sison. We are looking forward to seeing you at Shangri-La Hotel, Bangkok, Thailand! SIGN-IN using your email address.